Each set of Lost Wax Playing Cards contains 54 playing cards featuring illustrations of royal figures from the 15th - 19th century Benin Empire. The Benin Empire thrived in what is now southern Nigeria and left an impressive record of their civilization in the form of bronze plaques commissioned by the King (Oba) to adorn the courtyards of his palace. 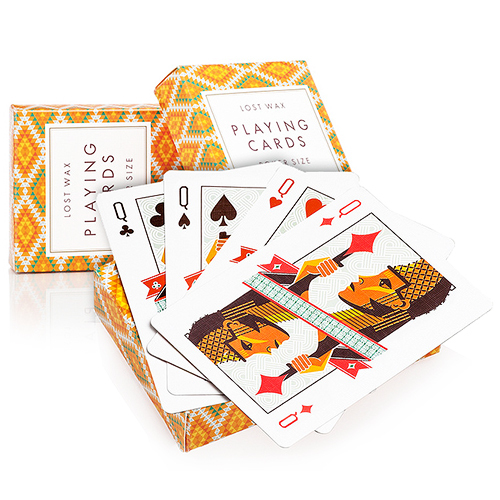 The playing cards pay homage to this prosperous period in Nigerian history and, in effect, bring this bygone era from the archives into modernity in a colorful and playful way. The images in these cards are rife with historic symbolism. For instance, the face cards carry markings of four distinguished Benin Kings, four Queen Mothers, and four respective Jacks (court servants). The sculptural forms that inspire these cards were created to honor the royal ancestors of the Benin nation. The ace of spades is also historically relevant. It shows a king represented as a fish-legged figure. This figure can be interpreted as a cosmological image symbolizing the correspondence between the King of Benin, ruler of the dry land, and the deity Olokun, God of the great waters. These cards bring a new dynamism to Nigerian popular culture and consciousness. Nigerians are influenced by their indigenous traditions but more increasingly by popular culture. Symbols of tradition—such as those that inspire these cards—are easily overshadowed by images drawn from popular culture. Since popular culture is grounded in the mundane and the persistent routines of everyday life, then this history too becomes implicit and fixed. The old Africa that inspired these artifacts has now lost much of its luster. If Nigeria’s prosperous past becomes common sense through these cards, then perhaps the notion of a brighter future won’t be so far-fetched. Each deck will be manufactured by The United States Playing Cards Company. • The cards are poker size. Αυτό το προϊόν προστέθηκε στον κατάλογό μας την Tuesday 16 May, 2017.